The Utah State Historic Preservation Office provides advice and guidance to government agencies who undertake projects subject to Section 106 of the National Historic Preservation Act of 1966 (NHPA) and Utah’s cultural resource law under Utah Code Section 9-8-404. 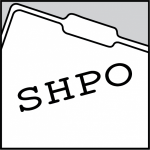 SHPO consults on projects purview to historic preservation laws to ensure federal and state projects don't carelessly destroy cultural resources. Projects include construction, rehabilitation, demolition, licenses, permits, loan guarantees, transfer of federal property, etc. State and local governments and others using federal funds are also required to comply with Section 106. The Utah State Historic Preservation Office has gone digital. All submissions will now be handled through an online platform, termed e106. The system is only for agency use, no consultants should use this platform unless there is pre-authorization through the SHPO or under FCC Programmatic Agreement. Standards still apply, so please consult the compliance guides above. Find detailed instructions for case submissions in the new system.